Shure will host members of the music industry community on a bi-weekly podcast—ranging from engineers who work behind the scenes to prominent musicians—to share their stories and shed light on the occasional studio secrets behind successful live music shows. The inaugural episode, which is available for download today, interviews U.K. artist Lianne La Havas and discusses everything from food and songwriting, and what a typical day off might look like for a busy artist. 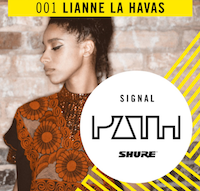 In addition to the first episode with Lianne La Havas, Shure will host an array of music industry talent, including live sound engineer Roger Lindsay, Bryan Grone, and William Garrett at Spotify Studios, multi-award winning mastering engineer Matt Colton, Chicago-based act “Poster Children,” Chris Jojo at Codemaster Games, and others. To listen to today’s episode, and subscribe to the Shure Signal Path podcast, listeners can head to their favorite podcast sources, including iTunes, Stitcher, and Google Play. The podcast will be updated every other Tuesday at 8 a.m. CST.